Oil-resin varnish has always been created by combining a resin with an oil, often through high temperature heats. Most common varnishes utilized down through the ages were intended to coat and protect furniture, architecture, boat-hulls and implements. Such common varnishes were composed of mostly oil -generally three parts oil to one of resin. As there is already ample oil within oil paints, special varnishes that were high in resin-content while low in oil were preferred and sought after by painters. 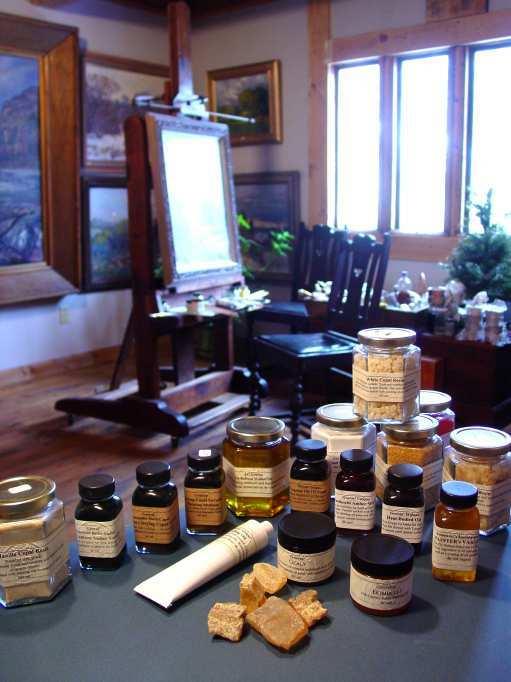 Western Maryland Gallery offers unique historically-accurate painting varnishes and mediums primarily intended for use with both handground oil paint and today's commercial 'tube' colors. Some of these varnishes have been used as far back as the 1400's. All of these varnishes/mediums allow certain desirable effects not attainable through the use of commonly-available varnishes or by straight oil-and-pigment paint, alone. These special varnishes produce proper effects when used within either an "all-oil" (no solvents) painting technique or within those methods involving turpentine, or other solvent-use. Oil paintings made with these same historical additives have shown excellence in craftsmanship and durability down through the ages. A properly-made oil varnish will not yellow to any noticeable degree, excepting with great age. These particular varnishes and mediums appear to have truly stood the test of time. 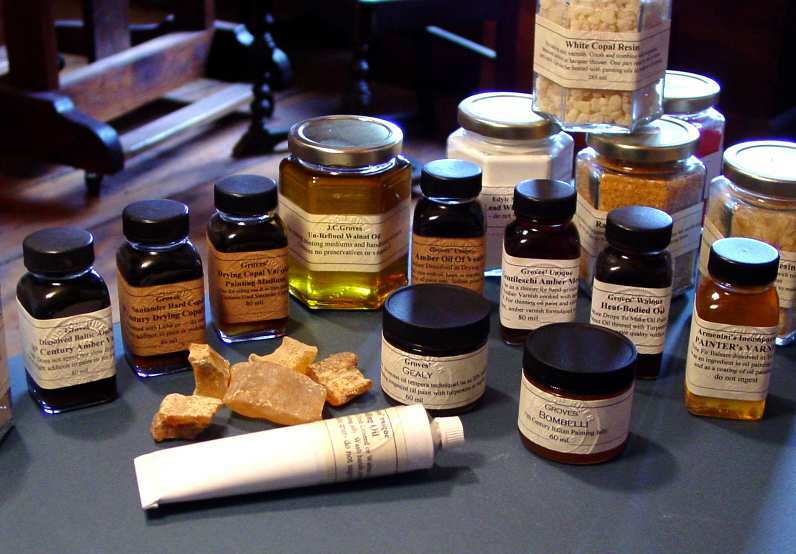 These historical painting varnishes /mediums are made in small batches. As aging is often important to strength and painting performance, the copal and amber varnishes are allowed to 'sleep' several months before sale. These varnishes/mediums are very strong in effects and, when utilized as additions to oil-colors, a bottle of any will last through approximately 20 or more 24"x30" paintings. Our painting varnishes and mediums are contained in either 90 mil. tube-form, or attractive 60 mil. glass bottles that fit perfectly into artist's sketch boxes. Click on each item's name for the complete historical and supporting research--includes method of use. Drying Walnut Heat-Bodied Oil ($30.00) This product is no longer available. According to the many paint-analysis studies done by modern researchers, a heat-bodied oil can be detected often in the old master's works. Curiously, many of these works exhibit up-standing paint texture that, instead, visibly reflect the typical effects of resin-oil-varnish-use within the paint. Thus, this up-standing quality is not in accordance with the melting effect truly garnered with the use of common HB-Oils-- like standoil and my own historical version of Heat-Polymerized Walnut Oil. However, through a long and complex cooking procedure, linseed oil and walnut oil can be transformed into a fluid oil that does indeed produce upstanding texture to fresh oil paint. I no longer make this heat-bodied oil -- it is too complex to imagine any olden painter making and using it. [ Note: There is another heat-bodied oil --the so-called "burnt plate oil" --made by greatly heating an oil until it catches fire and assumes the consistency of liquid rubber. This much-thickened oil found use in lithography during Rembrandt's day. Some painters today believe this type of oil was used by that master to create his expressive pastose paint; and this thinking again being based on modern-day chemical analysis of the master's paint-chips. Having myself made many trials with this "fired oil", using it with handmade paints, I must respectfully disagree. The character this highly-heated oil evokes with lead white does not typically match Rembrandt's clever craftsmanship; rather, its use creates nothing more than an extreme slumpy-sluggish-ness. The reader should bear in mind that according to latest research, high temperature resin oil varnishes --like Amber Varnish or copal varnish, which are resins dissolved at extremely high temperatures into oils-- produce signatures of only heat-bodied oil. There is no signature of the resin. Apparently, the highly-cooked resins lose their basic "fingerprints" due to high-temperature heat-destruction. Again, this is according to the latest research and analysis. Thus, recent proclamations maintaining the old masters used only simple pigment-and-oil plus additions of heat-bodied oil are not truly supported. Again, the commonly-available oil varnishes of the day --which nearly every household had at ready for ever-day use --give-off the very same finding of HB-oil. My own best-guess is the old masters utilized slight additions of highly-heated resin-in-oil varnishes to obtain the durability and application character of their wonderous paint -- and not simple heat-bodied oil. I encourage all to perform their own extensive trials in order to best decide the issue for themselves. I have often been asked if the specialized varnishes we provide can be used with tube paints. Certainly, they can. In fact, as we have noticed over the years, most buyers of our varnishes and mediums are tube paint-users who have need for strengthening their " tube colors" so that a thinning with solvent (such as turps) can be effectively performed. Painting by way of essential oils or spirits is a tried-and-true and very old manner of oil painting. Raw oil is used to rub up the basic paint, then a bit of varnish --usually a drop or two-- is added to stiffen or congeal the paint. This firm paint is then thinned for application using the chosen spirit, such as turpentine, paint thinner, or oil of spike. The paint is applied in thin translucent layers until the desired effect of realism is attained. The results are quite effective as, once given a slight dose of varnish, modern day tube paint will withstand much greater use of spirits, resulting in an almost egg-tempera-like manner of painting and building-up of layers ; promoting a quality of realism not nearly attainable without the varnish-addition. No other oil is incorporated with this manner. The principle underlying the effective use of this technique derives from the exceptional binding-strength and congealing capabilities allowable through use of the varnish-addition. This is to say, basic oil and pigment paint (either "tube" or home-made), by itself, cannot be thinned much with a solvent without becoming poorly bound (underbound) or running, trickling, down the support. However, as early painters eventually found, by simply adding a drop or two of varnish, the binding-strength of the paint is much increased, resulting in a much firmer resistance against solvent-delivered overpainting, even when the underlying paint is wet ; additionally, the applied paint gains in translucency, delivering a final highly-keyed brightness not available to an all-fixed oil technique. BTW, of great benefit, the step known as "oiling out" ( which is so important to the all-fixed oil technique) is not required when using the spirit-use manner of oil painting. This combined spirit-with-oil technique was that of Rubens and other Northern painters (as well as many Italian painters at least dating back to some of Leonardo's works). As for those tube paint-users today who prefer an all-fixed oil technique (no solvents such as turps, paint thinner, etc. ), our unique Amber Gelling Oil works well with tube paints. So does the "Gentileschi's Amber Medium" made from the Venetian Amber Varnish and unrefined walnut oil. Ditto our Walnut Polymerized Oil, replacing standoil to good advantage. However, the remarkable congealing (stiffening) abilities engendered by use of our amber, copal, and other varnishes were developed with hand-made oil paint in mind --like the stuff used by the olden painters. With handmade paint, these type high-in-resin oil varnishes provide character and interesting brushwork not found with modern day tube colors ; and this character is in addition to their lasting and optical qualities supplied to basic rubbed-up oil-and-pigment paint. By comparison, most tube paint today comes off the store-shelf already in a too-short condition. Adding our amber and copal varnishes will certainly toughen it--even optically brighten it-- but the consistency by that addition with some paint-brands may likely resemble window putty. All fine an proper if the painter wishes to then use spirit vehicles to subsequently apply the paint. But, excepting means of impasto, this stiff condition of the paint is not effective using all-oil, as the amounts of oil then added to make the paint easy of brushing would become excessive and troublesome. 'Oiling out' the ground before new paint-applications will help defray the problem. But, there is another way to incorporate these particular oil varnishes with tube paint in an all-oil manner. First, realize, regarding an all-oil technique, modern day 'tube paint' behaves differently than the freshly rubbed-up oil paint made by the artist. Many believe what they are buying is a very pure form of basic pigment-and-oil in a tube, ready and waiting for their whim to create. Not so. Tube paint has a gelling substance added in to promote a short 'buttery' consistency and maintain shelf-life (meaning little-to-no separation and resultant slumping in the tube). Usually, this substance is an addition of extremely lightweight aluminum stearate ; and even 2% of AS will mean a substantiat amount has been incorporated into the paint. This gelled effect-- very much similar to adding wax to oil paint-- makes the paint seem ultra heavy in pigment-to-oil ratio and causes a 'short' and crisp brushstroke that bears essentially no appearance to what the old masters used in their day. Of course, some paints do perform better than others in this regard. But, overall, the store bought tube paint provides little resemblance to the freshly made oil paint ( or what was created 'yarns ago' on canvas or wood panel with the same). Aluminum Stearate seems to date back to the 1930's but other tallow-type stabilizers very similar to it first came onto the scene in the late 1800's. In the 1940's, oil painters such as Frederick Taubes discovered that adding another 20th century product called "standoil" to tube paints overcame or balanced-out the aluminum stearate, easing or eliminating its short effect, allowing a "tall" or "long" (slightly more or complete enamel-like) effect -- quite similar to true basic all around handground paint. Taubes later created a copal varnish that relied heavily on standoil, and small additions of his copal varnish (called Copal Concentrate) would allow tube paint to behave much more like the old master-type paint. His product was marketed by the Permanent Pigments company and became quite popular. I supply this information to those who wish to obtain the older-type copal and amber varnishes displayed herein, but who desire to incorporate them with modern day tube paint in an all-oil technique. Essentially, the secret is this: to create mediums that allow tube paint to resemble the older paint, a certain part of that medium should contain standoil--or other polymerized, or sun-thickened oil--in the mix ; and this is to overcome the too-short gel-effect of aluminum stearate. For simple example, the "Copal Concentrate" of Taube's make was said to be a 25% copal-to-75% standoil combination. I have since copied it nicely by taking two parts standoil and one part of our 19th C. Copal Varnish and heating the two together. Thus, a 50% copal resin-to-oil varnish (like our 19th Century Copal Varnishes) would require a good bit of standoil to garner the "copal concentrate" effect on tube paint. [In other words, you find a small medicine bottle and put therein one part of the copal varnish and then slowly add two parts stand oil or sun-thickened oil.] Such a mixed 'copal & standoil' varnish is VERY light in color and can then be added in slight amounts to tube paints, giving them a certain long-ish clever character (Taubes called this 'conditioning' the paint) that stays put and doesn't run down the canvas or support with gravity -- as would be the case with standoil alone. 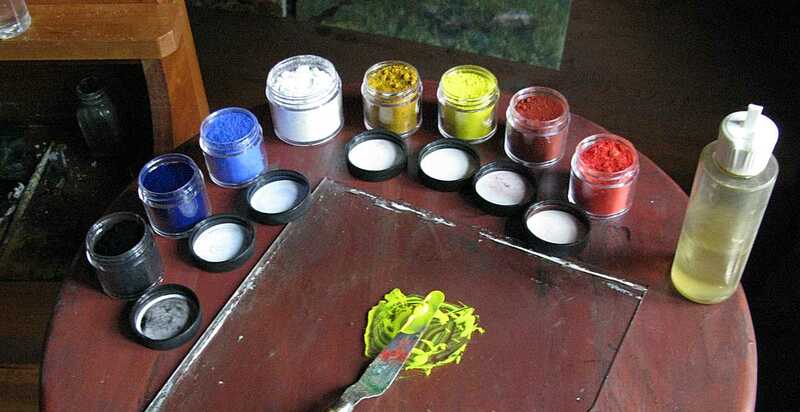 Various other and useful painting mediums for tube paints can also be made using this concocted copal-with-standoil varnish by adding in amounts of a preferred raw oil, turpentine, siccative drier, and/or other agents. To satisfy some tube paint users who wish a true fossil copal varnish-made painting medium, please note that we do offer our DCV Copal Painting Medium (see above) which will produce excellent and lasting results. What I write here notwithstanding, I understand there are some few paint-makers today who do make simple oil and pigment paint. Since there is no aluminum stearate or other gelling agent involved, these paints are perfectly suited to our straight varnishes for use in either a "spirit-technique" or an "all-oil" technique. Of course, for those painters who make their own paint, our varnishes--either alone or added to mediums --will provide all the tough and lasting optical qualities deemed desirable and necessary -- plus provide a shortening, chrispening character that is wanting to the basic handmade oil-and-pigment paint. For further information or to place an order, please use our onlne shopping page or call (301)689-3389 8:30 am-4 pm EST Tuesday through Saturday. Shipping costs are calculated according to number of items ordered. We ship only by USPS Domestic and International Shipping. There are some world countries (such as Nigeria) we cannot ship to. If in doubt, please call or email us (wmg@jamescgroves.com) before ordering. 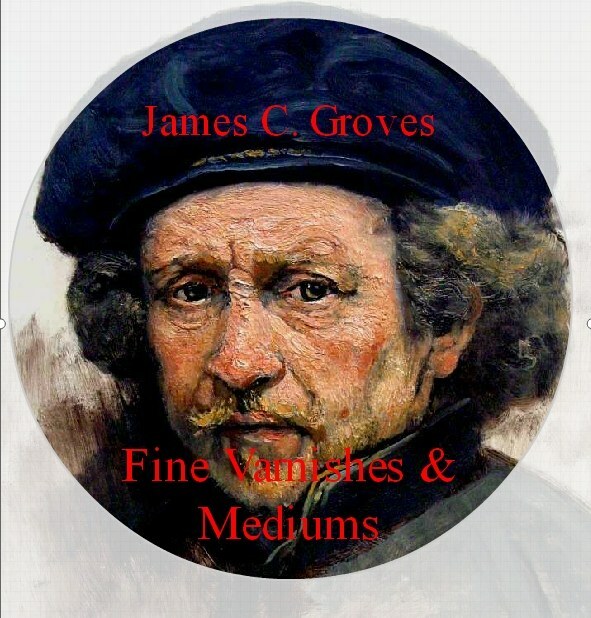 Click here to see some J.C.Groves originals.